BILLY BUNNY AND A HAPPY BIRTHDAY. Comes smiling round to you. "Oh, Mischief Man, please go away!" This is what dear good Uncle Lucky wrote in Billy Bunny's album, for it was the little rabbit's birthday, you know, and Uncle Lucky thought he ought to warn him against the Mischief Man. Well, as soon as the ink was dry so that the little rabbit could put the album away in Uncle Lucky's desk, the kind old gentleman rabbit said: "Let us take a ride in the Luckymobile. Maybe we can go some place where we will have a good time." So they got into the automobile and started off, and by and by they came to a shady spot in the woods. And there right under a big spreading chestnut tree, was a little table covered with a clean white cloth and in the middle was a lovely birthday cake with candles and big frosted letters, which read, "A Happy Birthday to Billy Bunny!" And oh, my, wasn't he delighted and so were all the little forest folk, for they were all there, let me tell you, from Old Squirrel Nutcracker to the Big Brown Bear. Turkey Purky, Danny Beaver, Old Mother Magpie, Timmy Chipmunk, Scatterbrains, the gray squirrel, and Shadow Tail, his brother. Daddy Fox would like to have been there, only Uncle Lucky hadn't sent him an invitation. The only friend who wasn't there was Uncle Bullfrog. He couldn't leave his log in the Old Mill Pond, so he sent his regrets by little Mrs. Oriole, who lived in the willow tree by the Old Mill. "Now we'll cut the cake," said kind Uncle Lucky, and he went over to the Luckymobile to get the big carving knife which he had hidden under the cushions. "There's a little gold ring hidden away somewhere," he said as he cut the cake very carefully so as not to topple over the pretty candles and get the pink and green melted wax all over the white frosting. And then everybody ate up his piece of cake as fast as he could to find the little gold ring. "I've got it! I've got it!" screamed Timmy Chipmunk. But, oh, dear me. It wasn't the ring at all. It was only a hard nut. And the little chipmunk was so disappointed that he ran home to tell his mother all about it, and she gave him one she had found when she was a little girl in the toe of her stocking one happy Christmas morning. And in the next story you'll be surprised to hear who got the ring after all. 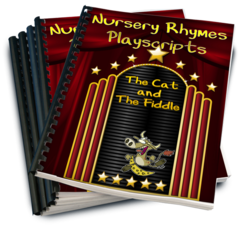 Have you see our fun play scripts?